In a bowl, beat two eggs and a dash of milk. Sift the flour into a large mixing bowl. Make a well in the middle of the flour and pour in the egg mixture. With a whisk, begin drawing in the flour, adding milk a little bit of a time until all the milk is gone and there is a smooth batter. Cover the bowl and let it stand for at least 30 minutes (it can sit in the fridge in this state for a few hours). Preheat the oven to 425°F (220°C). Put a dash vegetable oil or shortening into each cup of a 12-hole bun/muffin tin and heat in the oven until very hot and just starting to smoke. Give the batter a quick whisk and pour into the cups of the tin as quickly as you can. Put the tin in the oven and bake for 20 minutes. 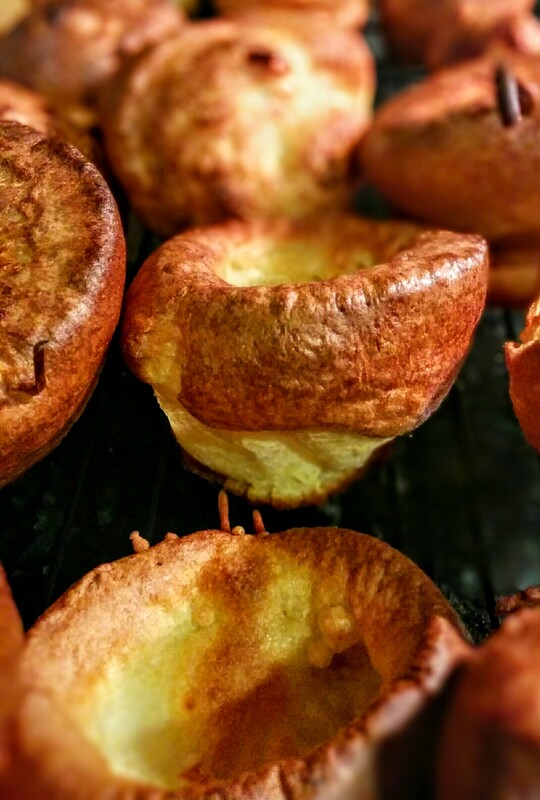 Successful puddings should be well risen, golden and crisp. Serve immediately. If you allow the puddings to cool, you can put them in a bag and freeze them. Put them on a baking sheet in a preheated 425°F (220°C) oven for 5 minutes to reheat. For smaller puddings, try halving the quantities. For crispier puddings, substitute as much as a quarter of the milk for water. For toad-in-the-hole, use a 10-inch square roasting tin (or a rectangular tin with a similar area) with enough vegetable fat to lightly coat the base when it's heated. Add a few pre-cooked mild sausages to the tin and then pour the batter around them. Baking will take an additional 5-10 minutes.